For years now, leaders in almost every industry have accepted two completely false assumptions–that change is hard, and that engagement drives results. Those beliefs have inspired expensive attempts to shield employees from change, involve them in high-level decision-making, and keep them happy with endless “satisfaction surveys” and workplace perks. But what these engagement programs actually do, Cy Wakeman says, is inflate expectations and sow unhappiness, leaving employees unprepared to adapt to even minor changes necessary to the organization’s survival. Rather than driving performance and creating efficiencies, these programs fuel entitlement and drama, costing millions in time and profit. Recent polls show that 70% of workers think about quitting their jobs every day. That number would be shocking—if people actually were quitting. Worse, they go to work, punching time clocks and collecting paychecks, while completely checked out emotionally. 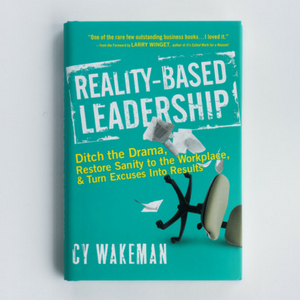 In Reality-Based Leadership, Cy Wakeman reveals how to be the kind of leader who changes the way people think about and perceives their circumstances. Cy guides you to deal with the facts, give helpful and clear feedback to employees, and kindly help others focus their effort on their contribution and not the nearby drama. Filled with dynamic examples, innovative tools, and diagnostic tests, this book shows you how to become a Reality-Based Leader. It helps you uncover destructive thought patterns within yourself and others, diffuse drama and lead the person in front of you. If you want to lead more and manage chaos less, this book will empower you to do it! A New York Times Hardcover Business Best Seller, The Reality-Based Rules of the Workplace is quickly becoming a “must have” for employees and managers in organizations across many industries. Discover the key to understanding how your manager calculates your real value—and how to boost it! More than anything else, you need to understand exactly how your employer evaluates you, and your annual performance review doesn’t tell the whole story. 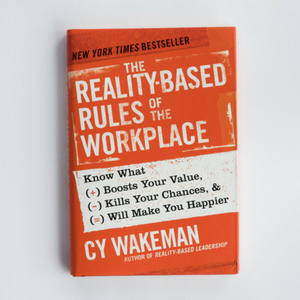 In The Reality-Based Rules of the Workplace, Cy Wakeman shows how to calculate how your true value to your organization by understanding your current and future potential against your “emotional expense”—the toll your actions and attitudes take on the people around you. 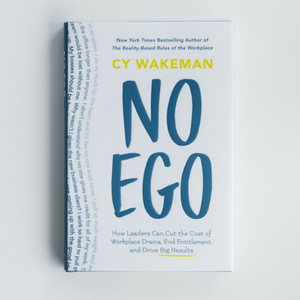 With Cy’s clear, straight-to-the-point advice, you can confront and reduce your emotional costliness, become an invaluable member of your team, and even learn to love your job again.